The process couldn’t be easier. Simply call us on 0800 392 392 or use the form on this page to get a quote for your unwanted car. You’ll get our best price and we’ll arrange a suitable time to collect the car and pay you cash instantly. Therefore, you can Contact us today. Are you tired of looking at that old car, van, or ute taking up space in your yard or on your driveway? Yeah, we understand that frustration. That’s why we keep a fleet of trucks operating throughout Auckland, so we can respond to vehicle removal requests quickly. Plus, we pay cash in hand at the same time as taking your vehicle away. Getting cash for Japanese cars simply couldn’t be easier. We buy Toyotas, Mitsubishis, Nissans, Mazdas, and any other makes and models of car, whatever the condition be it damaged, crashed, unregistered, unwanted, junk, scrap cars. Your car could completely dead, a total rust bucket, or a smashed-up wreck – we don’t mind. Whatever condition your car is in, we’ll take it away for free and we’ll pay you cash for the privilege. That means cash in your hand at the same time we remove your car. You can also be sure you are getting the best possible cash for your unwanted cars rate too, as we pay the best prices in Auckland. Find out how much you can get by contacting a member of our team now on 0800 392 392. At Japanese Car Parts, we take our responsibility to the environment seriously. 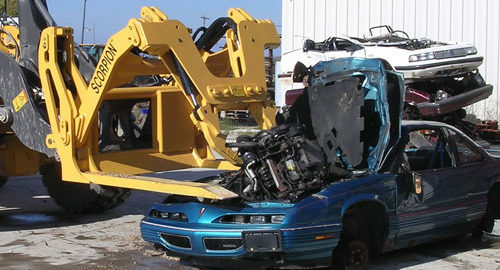 As a result, we have strict procedures in place when we pay cash for unwanted, damaged, junk, or scrap cars. This includes recycling as much of the car as possible and then disposing of whatever is left in an environmentally-friendly way.